Most of us that enjoy puttering in our gardens are aware of the bee shortage. The reason I am discussing this is............my zucchini ! 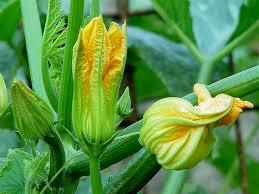 The plant that you hear people complain about because it produces so many green squash! I noticed that some of my zucchini were begining to turn yellow at the blosson end, I was concerned that I possibly had an issue with my soil. So..................GOOGLE........what did we do without you years and years ago? 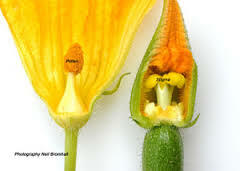 Did you know that there are male and female zucchini flowers? I didnt, until I Googled it !! My zucchini were turning yellow, due to poor pollination. DUH......I had never thought of that. So I learned the difference and how to pollinate my female flowers with the male flowers. Here is where the fun part comes. The flower on the left is the male Early in the morning, you pick the male flower and peel back the petals. Wear gloves because you do not want to get the pollen on your clothing. Then when the female flower is wide open, take the male flower and rub the structure at its center, covered with yellow pollen, into the center of the open female flowers. This must be done in the morning because pollen is only viable for one day. I did this on a few of my female flowers and it does work. Its been a good day, I learned something new ! !